I’m really excited to introduce a brand new regular feature to my blog today! I’ve been working with the wonderful Eva from Girl Counting Pennies to put together ‘Frugal Feast’, a collection of frugal recipes designed for people on a budget like us! Eva and I are both working really hard to save money in order to pay off our debts faster and grocery shopping is one area where we have both cut back significantly. However, we’re determined not to live on bread and water for the length of time we’re in debt for and that’s how this feature was born. Every fortnight on Tuesdays, Eva will be posting her ‘Frugal Feast’ recipe here on A Disease Called Debt and I will be posting my creation over at Girl Counting Pennies – so don’t forget to visit Eva’s blog to view my recipe after reading her great recipe below! Welcome to the first edition! Take it away, Eva! Hello! 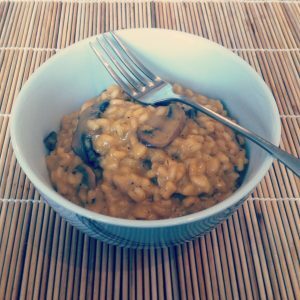 I am Eva, and I am really excited to share my mushroom risotto recipe in this first edition of my new bi-weekly column “Frugal Feast” over here at Hayley’s blog. This recipe is quick and easy, and although it does involve a lot of stirring, anyone can make it. 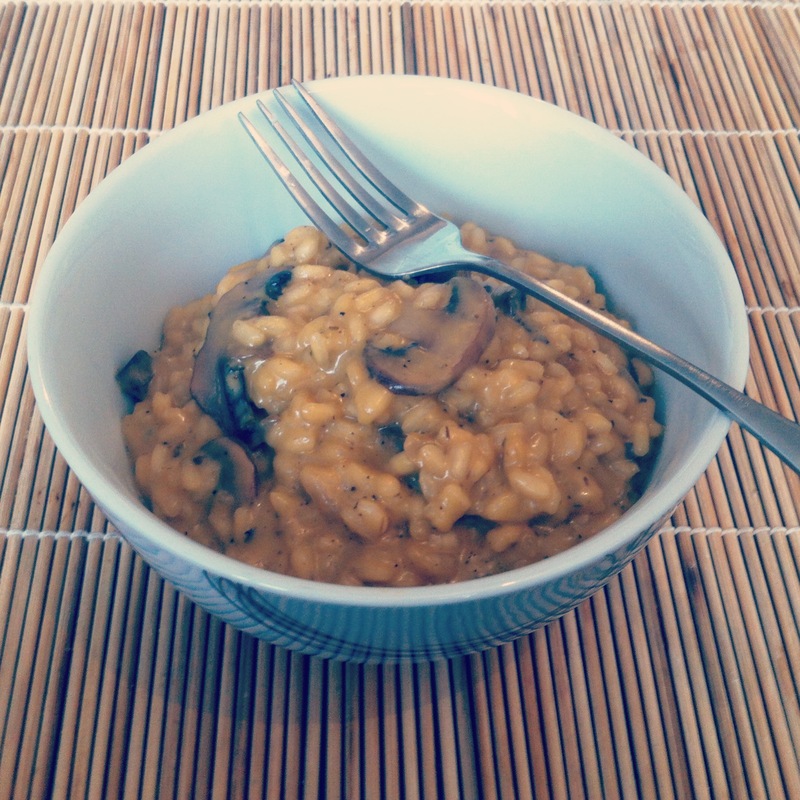 I make mushroom risotto about once a month and usually freeze whatever is left in small lunch boxes to take to work. I normally serve it with rocket salad and cherry tomatoes. Cost: The above ingredients make 6 adult portions at around £1.00 per portion. You will need a big non-stick saucepan, a deep frying pan, a chopping board, a tablespoon, a wooden spoon to stir, a knife and some paper towels. Wash and finely chop your mushrooms. Let them dry on a paper towel. Meanwhile, finely chop an onion and garlic into small cubes. Place a frying pan over a medium heat and add 2 tbsp of olive oil. Add finely chopped onion and garlic, stir for about 2-3 minutes until golden and add your mushrooms into the frying pan. After another 5 minutes, change the heat to the lowest possible and keep stirring occasionally. Meanwhile, place your non-stick saucepan onto the stove. Rinse your rice under cold water, dry and tip into the saucepan. Pour 3 big glasses of water into the saucepan to cover the rice and set your stove to the medium heat. Keep the saucepan over a medium heat, simmer the rice and stir often. Once the water has evaporated, add 1/2 cream of mushroom soup and keep stirring for another 5 minutes. It should start to become creamy, gooey and tender. While the rice and mushrooms are simmering in separate pans, quickly chop your cheese into nice little cubes. Your mushrooms should now be soft and ready. Pour the contents of your frying pan into your saucepan and stir your mushrooms into the mixture. Keep stirring for about 5 minutes. Add 1/3 of your cheese cubes and stir them into the mixture too. Pour the rest of your mushroom soup into the saucepan and as always, don’t forget to stir. Once the first portion of the cheese has melted, add another 1/3 portion and keep stirring. Repeat again once all your cheese has gone. Continue stirring until the rice is cooked and the cheese has melted. If the rice is still undercooked, add some more water. Season with salt, pepper and dry oregano to give your risotto a nice flavour. Leave to simmer on the lowest heat possible for the final 5 minutes. Serve with cherry tomatoes and/or rocket salad. I hope you enjoy my variation of this recipe! It’s very easy to make, I promise! If you have any questions, then please feel free to ask away in the comments section below and I’ll be happy to answer them. Why I’m swapping wine for green tea. Save money and swap: 17 swap websites reviewed! How to survive buying gifts for others whilst paying back debt! Oh, that sounds really good. Anything with cream of mushroom soup hits the spot for me. I’m looking forward to more recipes! I love mushrooms too! Mushroom soup is one of my favourites! Mmm, looks like a great meal for the cooler evenings of fall and winter! I’ll love risotto! I love risotto. This looks delicious! Great idea for a series ladies! I was so excited when I saw this because I’m always looking for vegetarian meal ideas since I want to try to eat less meat. I remember you saying that when you look for a recipe you type “quick and easy” in the search box! 😛 Here you go! It’s so easy to make and it tastes heavenly! Most of my recipes (if not all, I am still undecided) will be vegetarian, and I hope you will find them useful. Looks delicious, ladies! I agree – being on a budget does not mean meals still can’t be good. Looking forward to this series! Thank you, Shannon! My grocery budget is pretty tight, and I’d like to show that despite that you can still make healthy and nutritious meals! Awesome – can’t wait to read the whole series of recipes for cheap UK based recipes. Thanks guys! Thanks, Graham! 😛 Let us know if you end up making one of our dishes and how it turns out! Hey Hayley and Eva and thanks for a wonderfully fun new series 🙂 I look forward to what you all come up with and while I am not a mushroom fan, your dish looks delicious and nutritious! lyle @ the Joy of Simple recently posted…On Why I Enjoy Having A Cold!! Thank you for your kind words, Lyle! Mushrooms always make everything taste better. It’s a good meat replacement. save. spend. splurge. recently posted…How does an almost 30-year old have over $300,000 saved while only earning $20,000 net a year? I agree! I love mushrooms and use them in my meals more or less every week!